Ridiculously addictive. Easy to make. Be careful who you make this for! This recipe is super simple. It is actually a recipe by Sunny Anderson (an American celebrity chef) which she calls Bacon Bark. I changed the name because after 3 attempts to make it, it never came out like “bark” and I am not convinced it could because there is simply not enough toffee/candy to spread and hold the Bacon and nuts together. It does stick together in chunks, but not like “bark”. So I thought candy was a more suitable name for it. 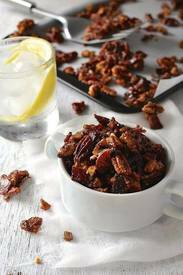 It’s like candied nuts – but with Bacon added. You can break it up completely, all leave it in bigger chunks (which I prefer).